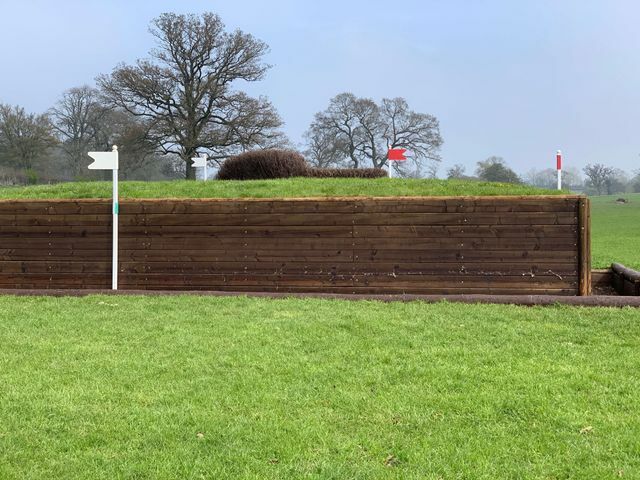 In his third year as Badminton course designer, Eric Winter has kept his philosophy of making his track look as naturally cross country as possible. 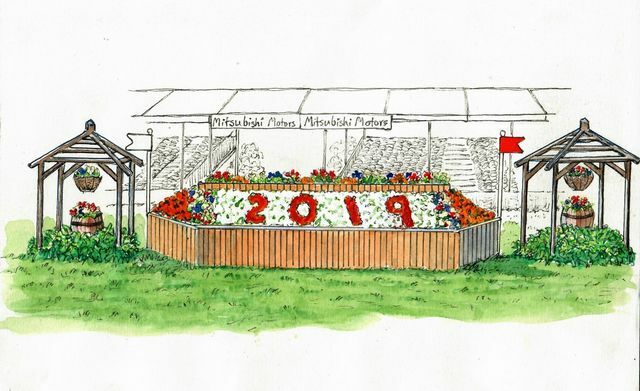 As usual the ASX Starter flower bed (1) is in the main arena, then riders hang right this year down to the Keepers Question (2) a table over the ditch. Crossing the road they rise to the Little Badminton Gate (3) reached up quite a steep incline and head for Savills Staircase (4 abc 5), a big log parallel, down the two stone steps and a tight left turn to another log parallel away. A bit of an uphill canter and a right turn to the Worcester Avenue Table (6) then back on track to Joules Corners (7/8) of boxed hedges. Next comes the Countryside Log Piles (9ab), a choice of one large one or a double of smaller ones. A bit of a breather till things start to get serious. The Shogun Sport Hollow (10 ab) has a funnelling pagoda to lead riders to a narrow ‘coffin’ ditch, which actually is coffin shaped, and a left or right choice of chunky, narrow tree trunks out. Now we enter an area of intense action. The KBIS Bridge (11, 12) is a massive parallel over the famous Vicarage Ditch. The double numbering allows for a two jump escape route. The next obstacle has been at Badminton in some form since 1949, the Outlander PHEV Bank (13 ab). Fast route is head on to the top, down, over a narrow brushed roll top. A quick let up with James’s Brush (16) and back along the Vicarage Ditch to the Mirage Water (17 abc 18). Despite several options, the direct route involves a corner on the left of a timber box, a right curve over open water and right to another corner on the left of a final box. Heading back to the deer park the next is the Nyetimber Heights (19 ab). Up a steep slope to an airy brush on the top of the mound, down into the dip and up for a choice of four narrow scrubbing brush skinnies. 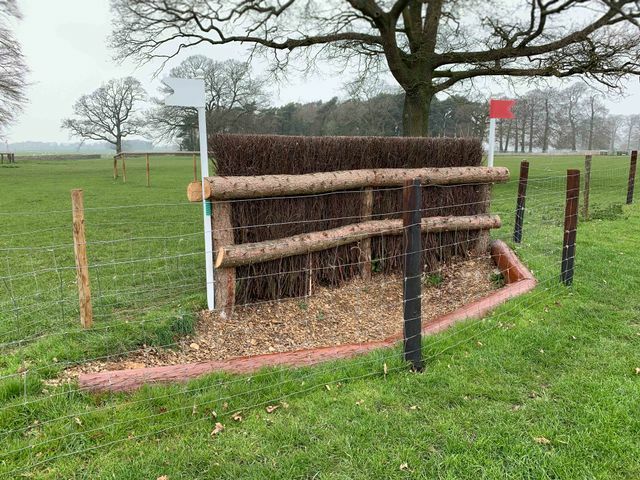 The Feedmark Haywain (20) has featured all over Badminton Park in recent years and takes riders to this year’s charity fence the YoungMinds Brushes (21,22,23), three asymmetric corners in a row. There is always a considerable crowd round all the fences on the course, but now comes the cauldron of the lake area. First is the World Horse Welfare Lakeside (24). The actual jump is basically a large parallel, but the design, with a pump station, extends over the lake and creates an attractive waterfall. Then it is along the lake to The Lake with L200s (25 abcd). 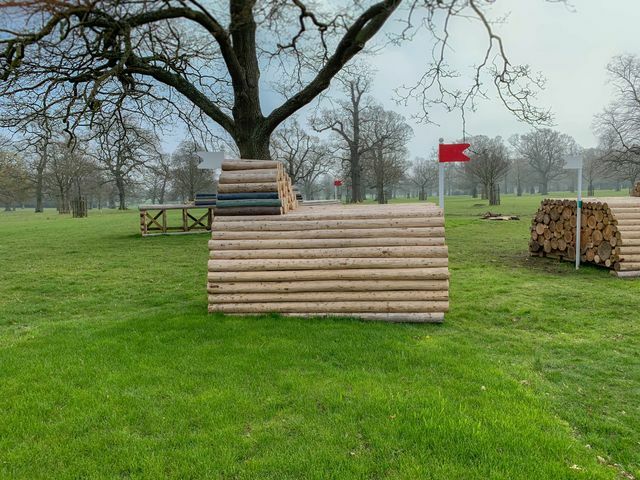 Eric has pulled the brushed up entry log back, so there is now a grass landing before entering the Lake, then a step up and this time the L200 will have a trailer which hosts the jump, a dome shaped Aintree type fence. Keeping the massive lakeside crowd entertained, the course doubles back to the Wadworth Lower Lake (26) a triple bar approached through the water. The Trade Stands Hedge (27) is a friendly let up before the Voltaire Design Huntsmans Close (28 ab) which involves a birch parallel to a birch spread corner on a right turn.